Special Open Thread: Even Obama Fans Don't Believe the Liberal Media?! The license plate blurred to protect the guilty. 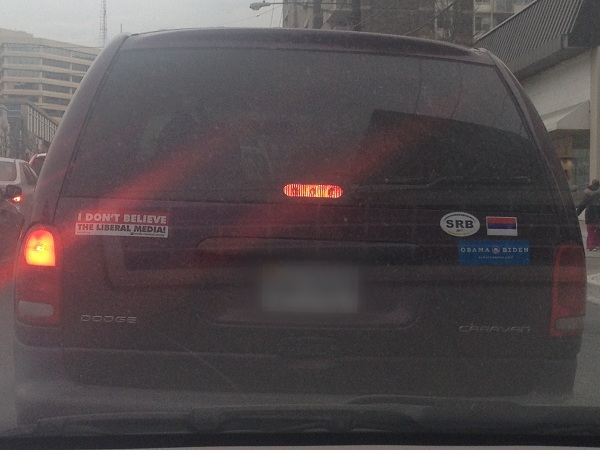 You'll notice this fellow has both an Obama-Biden bumper sticker and a Media Research Center (MRC) "Don't Believe the Liberal Media" bumper sticker. Cognitive dissonance? A family with divided politics? Or is it possible for the liberal media to be too liberal for even some Obama voters' tastes?